Heritage hogs are prized for their flavor and tenderness. The meat is a dark pink and delicious! It is definitely different than "the other white meat". You will notice a big difference between the usual tasteless grocery store pork, raised in confinement, heavily treated with antibiotics and growth hormones, and our pasture raised, medication-free pork. 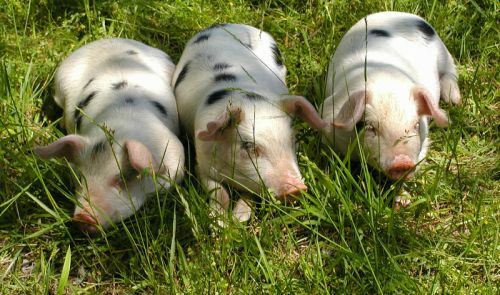 Living a life in the sunshine and fresh air, foraging according to their behavioral instincts, our hogs live the life pigs ought to live. We sell our pork in half-hog shares. They generally run between 55 and 60 pounds of meat, but varies with the size of the animal butchered. You will get a ham (whole, cut into roasts, or cut into steaks), pork chops, bacon, ribs, a couple of roasts, and sausage. Please see our additional information sheet on what to expect from your share.